Single domain protein with poorly structured termini, in particular 28-residue long C-termnus. NMR models are of a dimer. Structurally variable regions were removed from NMR models for evaluation of predictions. Ribbon-helix-helix, similar to Arc repressor. Contains HTH motif, but binds to DNA trough β-strands in a β-sheet formed by dimerization. Comparative modeling: easy. Quite similar to the templates, but needs to be refined as a dimer. Since most servers refine monomers, the quality of predictions is likely to be negatively affected. 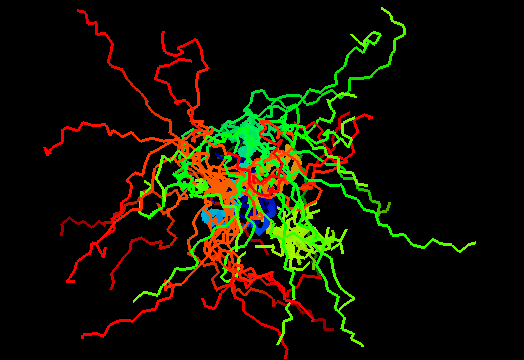 Ribbon-helix-helix proteins, e.g. 2bj1. The templates lack N- and C-terminal extensions, however, they turn out to be unstructured in NMR models. No discrepancies. PDB sequence is the same as the target sequence. Matches Ribbon-helix-helix protein, copG family (RHH_1) in Pfam. First models for T0474: Gaussian kernel density estimation for GDT-TS scores of the first server models, plotted at various bandwidths (=standard deviations). The GDT-TS scores are shown as a spectrum along the horizontal axis: each bar represents first server model. The bars are colored green, gray and black for top 10, bottom 25% and the rest of servers. The family of curves with varying bandwidth is shown. Bandwidth varies from 0.3 to 8.2 GDT-TS % units with a step of 0.1, which corresponds to the color ramp from magenta through blue to cyan. Thicker curves: red, yellow-framed brown and black, correspond to bandwidths 1, 2 and 4 respectively.